The BRM Booth at IMTS is where you’ll find Flex-Hone® tools for inner diameter (ID) deburring and finishing, NamPower nylon abrasive brushes for outer diameter (OD) deburring and finishing, and solutions like mini-brush kits for cross-hole deburring. So which tools are right for your application? When you visit BRM at IMTS 2016, you’ll see videos of our products in action and get to talk to our Technical Team. Bring us your parts or drawings, and we’ll recommend the right solution for your application. BRM is a full-line supplier of flexible hones and industrial brushing tools, and we work with a global network of distributors. Visitors to IMTS Booth N-7163 will also receive high-quality tradeshow bags, a convenient way to carry product information as you travel the tradeshow floor. BRM will supply a wide array of literature, too, including full-color brochures about Flex-Hone® tools, NamPower small-diameter abrasive disc brushes, NamPower diamond abrasive wheels, and our 12-piece miniature deburring brush kit. BRM’s flagship technology removes burrs and improves cylinder wall surface finish at the same time. With their unique construction, Flex-Hone® tools are self-centering and self-aligning to the bore. That's not all. Abrasive globules provide a soft cutting action, and the ball hone’s metal mounting stem supports its use with handheld power tools and production equipment such as CNC machine centers, transfer lines, and robotic cells. Talk to BRM at IMTS to learn more. Big things come in small packages. 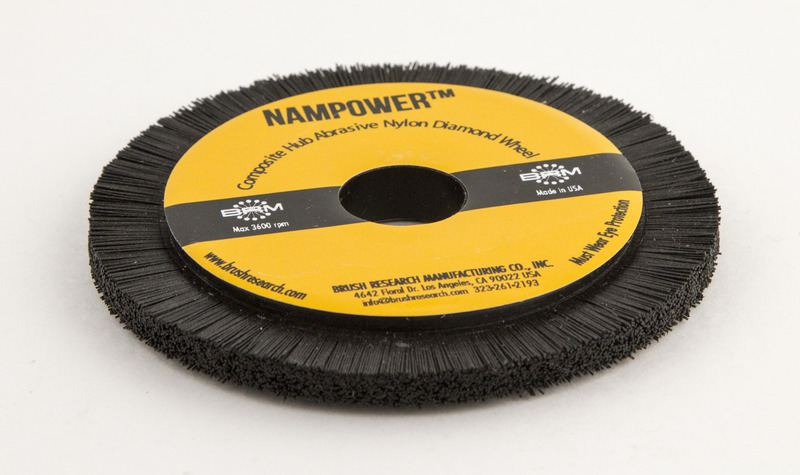 NamPower mini disc brushes provide greater versatility in harder-to-reach areas, smaller applications, and planetary head mountings. These high-performance brushing tools are ideal for use with automated equipment, and they come in 50-mm, 60-mm, and 80-mm diameters. Visit BRM at IMTS and discover whether you need dot or turbine-style tools. 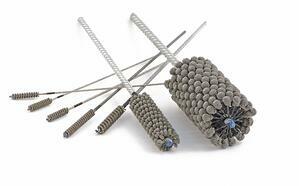 BRM’s NamPower family of nylon abrasive brushing tools is strong and growing. 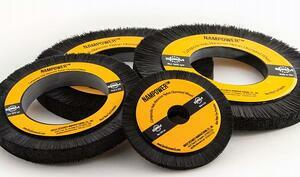 NamPower diamond wheels feature sturdy composite hubs and long-lasting diamond abrasive filaments for polishing and producing edge radii on carbide, CBN, ceramic, diamond, hardened tool steels, and glass. When you're at IMTS 2016, ask the BRM Technical Team about applications involving reamers, end mills, drill, taps, gear hobs, and shapes. We're ready to help you solve your outer diameter (OD) surface finishing and deburring challenges. Small holes don’t have to mean big problems for manufacturers. BRM’s miniature stainless steel brushes for cross-hole deburring won’t remove the base material or become clogged with particles and debris. Easy-to-use and corrosion-resistant, these miniature deburring tools are also cost-effective because 12 of them come in a special brush kit. Ready to learn more? Then visit IMTS Booth N-7163. 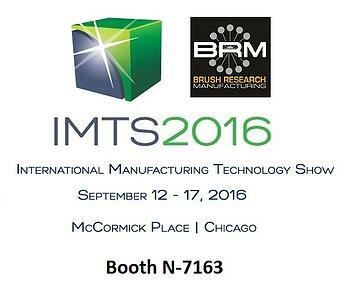 Now that you know more about some of our surface finishing and deburring tools, are you ready to meet BRM at IMTS 2016? Let’s set a date and time so it’s on both our calendars. Request a meeting with BRM today, and get ready to make the most of your experience at this premiere manufacturing and metalworking event.